The part 1 post for Van’s Service Bulletin 18-02-02 covered the steps necessary to perform the needed modifications to the WD-1207 & WD-1208 stabilator horns. Here in part 2, the steps necessary to prepare the stabilator for the new hinge brackets will be covered. The hinge bracket work begins by removing the existing HS-1213A & HS-1213B hinge brackets along with the HS-1210 hinge stops from the stabilator assembly. The removed HS-1213A & HS-1213B hinge brackets are relegated to the scrap box … but the HS-1210 hinge stops and all hardware are to be saved for reuse (I’ll be replacing all the bolts that screw into nutplates during final assembly). The existing HS-1213A & HS-1213B hinge brackets along with the HS-1210 hinge stops are to be removed from the stabilator assembly … save the four round HS-1210 hinge stops and discard all the HS-1213A&B hinge brackets. Hinge bracket assembly on the right has been removed and will be discarded … the one on the left is next on the hit list. At this point some rivets need to be removed and new rivet holes drilled. Because of limited room in the hangar the majority of the following photos in this post will show the work performed on the hinge brackets for the left side of the stabilator … keep in mind, the same work also needs to be performed for the right hinge bracket as well. Once the old hinge brackets are removed, the next step involves removing six rivets (three on each side) common to the HS-1202 forward spar and each of the HS-1212 ribs inside the stabilator’s spar box. For most all builders/owners these rivets will be pop rivets so the mandrel is driven out and the rivets are drilled out. 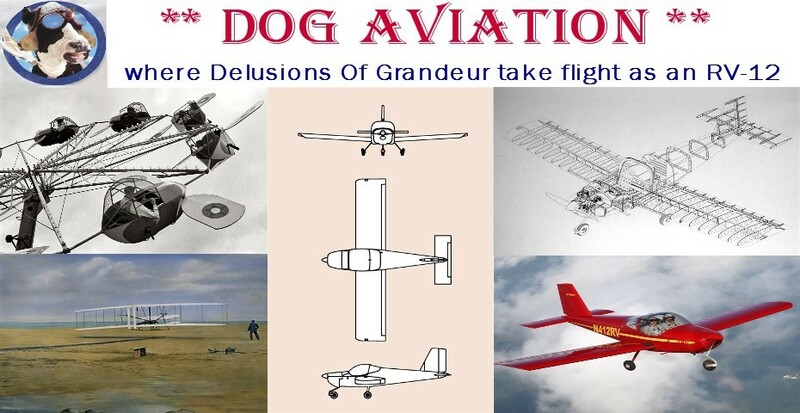 However, as can be seen in the photo below, the DOG Aviation RV-12 was constructed using solid rivets at this location which complicates matters a tad bit. The pink arrows point to the three rivets on the left side that need to be drilled out …. For most all RV-12’s these three rivets will be pop rivets and NOT the solid rivets shown here in the photo. These three rivets also need to be removed from the right side as well. Unfortunately, my work was made just a little more difficult in that solid rivets were used at this location during assembly of the DOG Aviation RV-12. Normally, when removing a solid AN470AD4 rivet, the center of the rivet is center-punched then a small lead hole is drilled to act as a guide for the larger #30 drill bit. There was plenty of room to drill the center rivet to #50 then final drill to #30 to remove the rivet. However, did not have the room necessary to drill the other two rivets close to the stabilator’s skin because the chuck on the drill would not clear the skin. If there is not room to drill a lead hole, it makes getting the #30 drill bit perfectly centered and keeping it that way while drilling extremely difficult to say the least. Fortunately for me, earlier in the build when completing the Service Bulletin to upgrade the F-1206F bearing bracket, I had a special tool machined for me by Mike at Cleaveland Aircraft Tool that sits over the head of an AN470AD4 rivet. The tool has a hole down the center for a drill bit and assures perfectly centered drilling of an AN470AD4 rivet head … it works great! I had two made, one for drilling #50 lead holes and one for drilling #30 holes. The two custom made drilling guides assure a perfectly drilled AN470AD4 rivet … one guide is used to drill #50 lead holes and the other for drilling #30 holes. The drilling guide with a #30 drill bit inserted … this setup drills through the center of an AN470AD4 rivet every time. When using the drill guides, it is necessary to stop often to clean the drill bit’s flutes because there is nowhere for the shavings to go so they become packed in the flutes. So using the drill guide takes a little extra time and some patience … but the end result is a perfectly drilled rivet without enlarging the existing rivet hole. Thus far, I’ve had superb results every time I’ve used the drill guides to remove a rivet. After the three rivets on each side were drilled out it was possible to retrieve the six tails from inside the spar box by lifting the stabilator up and moving it around until the all the rivets fell through the holes for the counter weight. Takes a little patience and perseverance but the rivets are retrievable. Using the drill guide and a 12” #30 drill bit to remove a rivet close to the stabilator skin. At this point, I deviated slightly from the plans and stepped ahead a bit because it was one of the last days with fairly warm temperatures and I wanted to prime those areas on the stabilator skin that will be covered by the HS-01231C stabilator hinge gussets. Two rivets need to be removed from the stabilator prior fitting each one of the four HS-01231C stabilator hinge gussets. After removing the two rivets each hinge gusset will cover, the HS-01231C stabilator gussets were attached with Clecos so tape could be placed around the edges of the gussets to reveal the area on the stabilator skin that needs to be primed. Now the stabilator needs to be flipped over so the same four rivets on the other side can be removed … and that side prepared for priming. My fingers are pointing towards the two HS-01231C stabilator hinge gussets sitting in position on the stabilator. Looking closely, one can see the heads of the two pop rivets under the gussets that need to be removed prior to installing the gussets. The four pink arrows are pointing to the four pop rivets that need to be removed on this side of the stabilator prior to installing the two HS-01231C stabilator hinge gussets. The same four rivets also need to be removed on the other side of the stabilator for the two stabilator hinge gussets that will be attached to that side. The HS-01231C stabilator hinge gussets temporarily secured in place with Clecos so tape can mark the footprint for priming. Primed area on the stabilator skin where the HS-01231C stabilator hinge gussets will sit. This is the first light coat … it was followed by another light coat topped with a heaver coat. After the primer dried the stabilator was flipped over so the other side could be primed as well. (Also of note: Sharp eyes may have noticed the dimple in the primed area which resulted from removing the flush rivet that was there … the dimple will be filled with the head from drilled out flush so there will be no voids under the HS-01231C gusset). After the primer was left to dry overnight, it was time to jump back and pick up the steps in the service bulletin where I left off by securing the new HS-01231D hinge doubler plate to the stabilator spar with three Clecos using the rivet holes of the rivets that were just removed. I would suggest screwing the four bolts into the assembly at this time to hold alignment for drilling. With the HS-01231D hinge doubler Clecoed in place and the four bolts in place, the remaining four #40 holes are used as guides to final drill #30 all four of the remaining holes into the stabilator’s HS-1202 front spar. Match drilling #30 one of the remaining four remaining holes in the HS-01232 hinge doubler into the stabilator’s HS-1202 front spar. Once the drilling is completed, the HS-01232 hinge doublers are removed for deburring and then each one is riveted in place using seven LP4-3 pop rivets. I used both a pneumatic rivet puller and the close quarter hand rivet puller to rivet the new HS-01232 doubler onto the stabilator’s HS-1202 forward spar. Using the pneumatic rivet puller to pull one of the LP4-3 pop rivets used to secure the HS-01232 hinge doubler onto the stabilator’s HS-1202 forward spar. Completed riveting of the HS-01232 hinge doubler onto the stabilator’s HS-1202 forward spar. With both HS-01232 hinge doublers now riveted in place, work begins on preparing the new hinge brackets. Following the steps in the Service Bulletin the new hinge brackets are comprised of two pieces … the actual hinge bracket HS-01231A and a second piece HS-01231B that has flanges used to create the “box”. These two pieces are riveted together to form the inboard and outboard hinge brackets. The only difference between the two assembled hinge brackets is the outboard hinge brackets receive a K1000-4 nutplate … so prior to riveting the two parts together there is a need to machine countersink two of the HS-01231A hinge brackets for the AN426AD3-4 rivets that are used to attach the K1000-4 nutplates. The HS-01231A (actual thick hinge bracket) and HS-01231B (thin part with the flanges) are riveted together to form the new hinge bracket assembly. As can be seen in this photo, the new inboard hinge bracket assemblies on the left are identical to the new outboard hinge bracket assemblies on the right … however, the outboard hinge bracket assemblies on the right receive K1000-4 nutplates and countersinking for the AN426AD3-4 rivets that secure the nutplates. Next the newly riveted inboard and outboard hinge bracket assemblies are temporarily bolted onto the stabilator’s HS-1202 forward spar so additional drilling can take place. (For this step I used shorter AN3-3A bolts with washers to save wear on the nutplate’s threads). Later, after the last of the drilling is completed, the hinge brackets need to be removed for deburring. The new hinge brackets temporarily bolted onto the HS-1202 forward spar. With the new hinge bracket assemblies temporally bolted in place, the HS-1210 hinge stops are attached to the hinge bracket assembly to help hold proper spacing during drilling of the flanges. The HS-01231C stabilator hinge bracket gussets are secured to the stabilator with Clecos using the two holes previously created when drilling out the rivets on stabilator’s spar. Time to drill ... the holes in the HS-01231C gussets are used as drilling guides to match drill into the stabilator’s skin and spar plus the flanges on the new hinge bracket assemblies. Note: At this time the three holes along the inboard edge of the HS-01231C gussets are only drilled to #40 … NOT #30 as all the remaining holes will be. The HS-01231C secured with Cleco’s …. Amazingly the holes in the HS-01231C gussets lined up almost perfectly with the flanges on the hinge bracket assembly … close enough to be able to get two #40 Clecos into the holes prior to match drilling. The holes in the HS-01231C gusset common to the inboard flanges on the hinge bracket assemblies are match drilled to #40. All the remaining holes in the gusset are drilled to #30. Using the holes in the HS-01231C gusset to match drill #30 through the stabilator skin and through the outboard flange on the hinge bracket assemblies. The process is repeated for the remaining three HS-01231C stabilator hinge bracket gussets. Here is the second place I deviated from the service bulletin’s instructions. At this point, due to clearance issues, the instructions would have the builder/owner drill the aft most inboard #40 hole in all the HS-01231C gussets to #30 so a pop rivet can be used at this location … this is because the head of the mounting bolt will interfere with a rivet squeezer. I decided NOT to enlarge this hole to #30 and will just remove the bolt and set the rivet with a pneumatic squeezer then reinstall the bolt. This will result in a consistent look with all three rivets being the same AN470AD3-3.5 … admittedly, more work though. As can be seen in this photo, the rivet holes with arrows pointing to them are the ones that the instructions would have the builder/owner drill to #30 for a pop rivet due to the bolt head being in the way to squeeze a solid rivet. I’ve elected to just remove the bolt to get the clearance needed for the rivet squeezer so will be setting a solid rivet at this location as opposed to leaving the bolt alone and drilling the hole larger for a pop rivet. And finally, the third place I deviated from the plans involves machine countersinking the HS-01231C gussets for flush rivets at those locations common to the stabilator’s skin. Did this to keep a consistent look because flush rivets were used on the stabilator’s skins during initial construction. Of course, I only know of one other RV-12 that used flush rivets on the skins so this step will not be a consideration for 99.9 % of RV-12 builder/owners performing the service bulletin. Test fitting the HS-01231C gusset … after all the match drilling was complete the gusset was removed to machine countersink the five holes common to the stabilator’s skin. Note the inboard aft hole on the gusset is NOT drilled to #30. Also, looking closely, one can see two of the five machine countersunk holes. Machine countersinking the HS-01231C gussets will not be necessary for 99.9% of RV-12’s … the DOG aviation RV-12 is unique in that it was constructed with flush rivets on the stabilator’s skins so performed the countersinking to keep a consistent look. With all the parts now match drilled, now would be a good time to mark the location and orientation of the HS-01231C gussets and the new hinge bracket assemblies so the parts can be removed for deburring and placed back on the stabilator at the same locations and orientations when drilled. After carefully marking all the parts to assure proper reassembly, the hinge bracket assemblies and HS-01231C gussets were removed for cleaning and deburring. The holes in the spars were deburred as best as possible. The final assembly and riveting will be covered in the next post.